Traditional methods of automotive aerodynamic pressure sensing are limited to labor-intensive pitot tubes or not very precise pressure-sensitive paints in wind tunnels. Similarly, quantifying spray patterns on windshields have been limited to egg cartons or qualitative patterns generated on paper. Leveraging super-sensitive capacitive sensor technology, PPS has developed sensor technology that can be adhered to the automotive body surface to measure ultra-low-pressure distribution and even quantify the distribution of spray mists where the particles are so small and suspended in air that there is no pressure differential. These and a few other sensing innovations will be presented. The introduction of affordable angular rate sensors is making many traditional vehicle measurements more straightforward and accurate. Angular motion can be measured directly rather than through complicated calculations from multiple accelerometers. Measurement principles and test results for a new rate sensor product will be presented. Ranges from 100°/s to 18,000°/s are available. Results will include demonstration of compliance to the NHTSA SA572 guidelines for rate sensors, including shock effects. A preview of a 6DOF, tri-axial rate and acceleration sensor will also be included. There is a big movement in the vehicle electronics market to improve code quality by adopting automated regression or continuous integration testing processes. The key is failing faster by running your test cases either continuously, on check-in, or nightly. Combining the open source Jenkins build server with VectorCAST creates a powerful platform that enables new automated build and test processes. In this presentation we will show you how quickly this powerful platform can be brought online. Wireless sensing has not always performed well in less than perfect conditions. However recent advances in MEMS sensors, radios and batteries have improved its performance and overall effectiveness, while options for managing and viewing data (including in the Cloud) have increased. This presentation will discuss the complementary role of wireless sensors with traditional ones in challenging applications such as mobile vehicle validation. Integration with a DAQ system and key success factors will also be discussed. Air, carcass and compound tire temperatures have a huge influence on tire performance and durability. OptimumG president Claude Rouelle will show the results of tests performed on flat track test benches and explain how and why the tire temperature needs to be introduced in flat track testing. He will also present the influence of tire models created with this new tire temperature dependent methodology and their influence on vehicle performance. Race Technology Ltd has developed RTLIVE, a cloud-based, mobile (3G) data-enabled telemetry system specifically designed for automotive testing. RTLIVE can run standalone or can take data from the vehicle CANbus, analog sensors or other instrumentation such as GPS speed sensors. Used standalone, RTLIVE sends position, speed and acceleration data. Data is available live on the RTCLOUD website or can be downloaded as a complete file for analysis on the included PC software. The reduction in aerodynamic drag improves energy efficiency of a vehicle, which in turn helps increase the range of battery electric vehicles and improve the fuel economy of ICE vehicles. With tires and wheels contributing to 25% of the total aerodynamic drag, a method has been developed to measure tire geometry in realistic operating conditions. The impact of the tire geometry in full-scale wind tunnel testing and the application of tire geometry data in vehicle CFD studies will also be presented. Testing can be a stressful time as the client is in the qualification stage with a tight timeline, looking to ensure that everything moves forward in a positive manner. With over 65 years' experience in testing, DTB will communicate processes that allow clients plan for success. Having tested diverse systems in the automotive industry, including lamps, airbags, sensors, seatbelts, navigation systems and many other entities, we have knowledge that can add value to customers, allowing a partnership leading to success. OEMs must certify their products in accordance with respective local regulations. Fuels are considered as a separate development component to ensure the clean emission concepts of the future. For this purpose, test fuels contain components within narrowly specified limits and thus differ significantly from market-typical fuels. This in turn gives particular importance to high consistency from batch to batch. Solutions are presented from the point of view of a globally operating company that has been producing test fuels for more than 30 years. Our partnership with local distributor Corrigan Oil has created an all-inclusive source for your test fuel needs. Many test programs require that products be tested with flammable materials on board. Examples include functional testing of fuel pumps and batteries. This presentation addresses some of the concerns associated with testing flammable materials from the point of view of the chamber manufacturer. 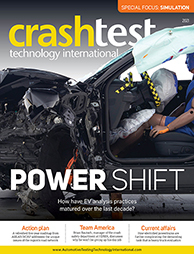 The design and validation of new technologies, such as lightweight materials and electric powertrains, presents unique challenges that demand a more comprehensive approach to test and measurement. Increasingly, high-definition fiber optic sensing (HD-FOS) is being adopted as an important tool to deliver continuous, high-fidelity strain and temperature measurements and new data insight that is not available with more traditional data acquisition technologies. Example applications include high-fidelity model verification of complex composite structures, high-resolution battery temperature testing, analysis of multi-material joints and bonding, and smart parts with embedded fiber optic sensors. The TireScan CrossDrive System by Tekscan Inc. is a dynamic tire footprint measurement system. This integrated solution is capable of measuring a wide range of footprints at a high resolution (1 mm). The system includes scanning electronics embedded into a ruggedized platform, which scans a semiconductive piezo-resistive sensor. This ruggedized housing is designed to handle harsh environments, allowing the system to collect footprint pressure data while the tire is experiencing shear forces from acceleration, deceleration, toe and camber. The intuitive, application-specific graphing and image analysis software enables quantitative and qualitative analysis of the tire footprint. Simulated environmental testing is an important part of product reliability. The use of energy for this testing can be significant. Many companies have started or will start sustainability programs. This presentation will examine ways to reduce your carbon footprint by lowering energy consumption and lower GWP (Global Warming Potential) refrigerants in your testing. With the use of advanced chamber controllers, responsible refrigerants and connected monitoring systems, you can reduce energy use. Discussions include recent mandates in Europe that all refrigerants of over 2,500 GWP be banned by 2020 and how this effects the North American market. Product failures often require expensive repairs or replacements. Over-engineering adds to recurring costs and its success is uncertain if the failure’s cause is not understood. Engineers need in-depth knowledge before attempting a re-design. This case study focuses on bus seat failures not predicted by industry standard tests. The goal was to collect comprehensive field vibration data and analyze that data to understand the failure’s cause. The study used accelerometers placed at various points in multiple seating configurations and across multiple field environments. Analysis identified transmissibility issues between axes of motion, as well as higher reliability seat configurations. The automotive industry is transforming into a high-speed data transmission and data computing industry. Following the release of 1 Gigabit Ethernet for the automotive industry (1000Base-T1), there could be vehicles with 10 Gigabit Ethernet being deployed on the roads by 2019. Device manufacturers face complex challenges validating leading-edge components, and thorough testing will be necessary. The presentation will discuss examples of how Automotive Ethernet suppliers can validate their new devices to ensure their latest components are performing at high speed, with low latency, zero packet loss and the highest reliability. It will explain how to simplify testing through automation and the latest methodologies. ATS' goal is to provide a one-stop shop to meet the testing requirements of automotive companies and perform failure analysis in the event it occurs. 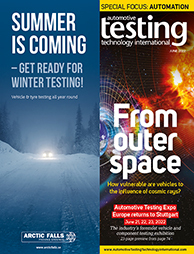 Automotive testing continues to evolve and change; we will highlight how we have partnered with companies in the past and what we project is on the horizon in the terms of future automotive testing requirements. We will discuss physical, environmental and chemical testing. Additionally, we will touch on 3D printing/additive manufacturing. This presentation will introduce BK Connect, a software platform developed by Bruel & Kjaer to seamlessly integrate all aspects of test, analysis and reporting. BK Connect enables users to convert measured data into actionable results in a seamless work flow. The platform has been developed around having configurable features and interfaces for different user roles in an engineering operation. The overriding principle in the platform's development is accelerating the measurement process, while reducing complexity and improving efficiency. BK Connect is a flexible, open and integrated platform that will “connect” people to information inside your organization. Pressure imaging has traditionally been used for static and quasi-static testing such as comfort, ingress/egress, and tire contact patch analysis. Recent innovations at XSENSOR now allow high-speed dynamic pressure imaging for applications such as rear impact whiplash, front impact seatbelt, vibration transmissibility, airbag deployment, and drive-over tire contact patch analysis. This presentation will look at technology improvements and showcase examples of dynamic pressure imaging applications. Characterizing electric motors and drives, especially for electric and hybrid vehicles, is a very important topic in many engineering labs worldwide. Every lab has unique interests in test and validate experiments using multiple pieces of measurement equipment from different suppliers. While these systems work, they often have high levels of complexity and operate much more slowly than an optimized system. This presentation proposes a solution specifically designed for motor and drive testing, consolidating many systems into one, enabling rapid efficiency motor mapping and custom advanced real-time analysis, which significantly boosts productivity, capability and research and development by many days and/or weeks. Customers in search of more reliable and repeatable leak testing processes are using robots for sniffing applications. The presentation will discuss benefits of robotic sniffer leak testing with an outline of best practices especially for leak testing automotive electric vehicle battery packs, fuel systems and vehicle air conditioning systems. For wireless distributed measurements on rotating components and moving machinery, imc offers telemetry systems for virtually any application in any industry, such as automotive, heavy machinery, marine, aerospace, railway and many others, from 1-channel and economical options, to multi-channel, highly dynamic robust solutions. There are transmission electronics available for a large variety of sensors, such as strain gage (quarter-, half- and full-bridge), thermocouples, PT100/1000, as well as IEPE sensors and voltage signals. Transmission rates of up to 100kHz per channel (higher optional), either inductive or via radio frequency, ensure trouble-free data collection of dynamic measurements. Acutronic has been providing innovative motion simulation and test solutions for the aerospace, defense and automotive industries for decades. Today, Acutronic systems are used to test airbag, DSC, and roll-over detection modules containing inertial sensors. Emphasis has been placed on creating turnkey solutions for component and module testing, and development of Hardware-in-the-Loop systems that utilize physical motion to expose devices to realistic representations of real-world driving conditions. This presentation highlights how Acutronic solutions can improve product performance and reduce time-to-market for sensor manufacturers, Tier 1 suppliers, and OEMs, including developers of autonomous driving solutions. As testing regulations continue to change globally, compliance with emissions standards is a central issue in vehicle certification. Varying standards across the globe continue to create hurdles for vehicle makers. With WLTP, the latest initiative for a new global technical regulation, BPG’s new control systems are addressing the needs and requirements of the emissions community and have been designed to grow as the testing needs evolve. Through active participation in global automotive emissions standards committees and conferences, BPG is well versed in the mandated EPA, SAE, and WLTP procedures, positioned to share its insights and latest technologies: the next generation of dyno controller. Aeration is deadly for engine components as air contamination in oil can cause thermal degradation to occur – ultimately causing varnish, sludge and carbon insolubles to form. Previously, the only way to test for aeration-induced failures was through hot engine (dyno) testing or in the vehicle. Understanding the aeration rate was a time-consuming and expensive endeavor. Now, new robust and accurate methods are available to measure the aeration rate under specific conditions and simulate the aeration rate to induce the failure modes caused by entrained and dissolved air in hydraulic fluids. Without the right tools, automotive testing can be a guessing game. Traditional temperature measurement tools such as thermocouples or spot pyrometers don’t always offer the resolution or speed needed. This presentation will discuss how automotive engineers and technicians can use thermal imaging technology to quickly identify problems to produce safer, more efficient and higher-performing automobiles. It will cover the various applications that thermal imaging is useful for, including improving the design of air bag systems, validating the efficiencies of heating and cooling systems, quantifying thermal impacts on tire wear, performing quality checks on bonds and welds, and more. Identification of volatile organic compounds (VOC) in automotive interiors presents considerable challenges for interior suppliers and OEMs. Concerns vary from unpleasant odours to potentially severe health issues. Successful material identification may often depend on the methods chosen for air sampling, analysis techniques, handling and preparation of test specimens, as well as the expertise of test personnel. This presentation addresses some of the key challenges in developing a VOC test and mitigation strategy as well as the strengths and weaknesses across the most common testing methods currently used. Dytran Instruments has introduced a smart, bus-based sensor for solving a multitude of measurement and monitoring challenges across many different automotive applications, including end-of-line testing, test cell shutdown and autonomous vehicle monitoring. Distributed processing is finally here! Each standalone sensor in the network is actually a powerful microcomputer capable of processing data and actually returning the condition of a machine via digital information on the bus in the form of a condition indicator. The end result is a great saving in system cost and weight. Additional advantages include the elimination of a central computer. AMS presents a complete toolchain for management, analysis and visualization of test data. Thirty years of experience in measurement data analysis are used for extracting information out of thousands or millions of test data files, reducing the complexity of the data by using measurement-specific analysis, reducing the analysis time by parallel analysis in a cluster and bringing the analysis to the data. An evolution-type approach for big test data analysis. Road load data (RLD) measurement enables insight into how a vehicle is used – but making sense of RLD can be challenging due to its quantity and complexity. Engineers need to be able to quickly and efficiently transform the data into actionable information and decisions. This presentation illustrates techniques to display and analyze road load data and draw actionable conclusions. It covers aspects of data display and visualization; analysis, including statistics, vibration, and durability; and reporting. Automated analysis and reporting techniques will be discussed as a means of handling the ever-increasing quantities of CAN and other road load data. Hardware-in-the-loop test systems used to verify functional safety requirements must meet stringent standards. Under ISO 26262, the test tools being used to assess the quality of an artefact must not malfunction in such a way that errors might pass undetected, as this could result in a false evidence of safety. This drives changes in the design, manufacture, use and maintenance of the HIL test system. This presentation explores the challenges of functional safety tool qualification and solutions implemented in the LHP HIL Test Platform for testing hybrid powertrain controls under ISO 26262. In addition to being accurate and reliable, wheel force transducers are now quicker and easier to install on passenger vehicles and commercial trucks. This presentation will cover multiple time-saving advantages of innovative wheel force transducers, including a review of a simple installation procedure and how using a stator angle corrector makes testing quick and easy. The stator angle corrector device eliminates the need for additional bracketry on steered wheels. The presentation also covers the ease, reliability and reduced data acquisition requirements of collecting wheel force transducer signals with CAN outputs. Lightweight composite design is an effective approach for reduction of CO2 emissions. A precise understanding of the vibro-acoustic and material behavior of modern lightweight materials is therefore becoming increasingly important. Composite or welded/bolted structures typically exhibit non-linear damping characteristics resulting from material and response properties. Traditional modal analysis, used to validate simulation models, assumes linear material behavior. This presentation will illustrate the study of complex, lightweight, non-linear structures with precise, reproducible force impacts in free-free conditions without disturbing the test object’s dynamics, combining the Scalable Automatic Modal hammer with a scanning laser vibrometer for acquiring 3D vibration components and extracting modal parameters. The number of tests required for autonomous and electric vehicles has increased dramatically compared with established standards in the automotive industry. This demand can only be handled by means of automation and adapting existing processes. Therefore, we developed a new solution for the EXAM test automation software, called the TestCase Generator. Its purpose is to generate test cases automatically from a test specification. The challenge was to align existing customer processes as little as possible. Thanks to the new system, test designers are able to handle 11 times more test cases, delivering test results earlier and covering more requirements. This presentation will be a spinoff of our article in the upcoming issue of Automotive Testing Technology International, “Sierra and Southwest Research Institute bring leading edge particle number sampler to market.” The paper focuses on a new solid particle sizing system for meeting the increasingly regulatory activity surrounding solid Particle Number (PN), which has become one of the more difficult challenges for engine and vehicle manufactures today. Ensuring measurement data access to stakeholders in the company with tools that are simple to learn, use, and maintain are paramount for efficient and streamlined test workflows. NI has focused on creating multiple products that increase users of all kinds' ability to access and utilize their systems and measurement data. This presentation will look at the implementation of Siemens' products for various testing applications in the automotive industry, specifically end-of-line testing for powertrain and e-car systems. From here to eternity, while maintaining phase! Data has become a diverse field of information. Today data includes serial streams, video streams, telemetry and conventional analog sources. But how critical is phase? When a test can be many hundreds of signals before you add the streams from sources such as CAN, video and positional systems, you need to have some level of confidence that phase is under control. The last thing you need is uncontrollable or in-quantifiable alignment in your data. The question is, how do you accommodate that which you know if you are also dealing with unknowns? The long-term fatigue performance of a tire, hose, bushing or other elastomer application is governed by the fatigue crack growth behavior of its compounds and the sizes of the intrinsic crack precursors in the material. The methods for characterizing the fatigue across multiple decades of crack growth rate, from threshold through ultimate tearing, will be described along with the crack nucleation testing approach for measuring the crack precursors. The use of this information for simulating the lifetime of rubber components will also be discussed. IPETRONIK has developed a new rugged environment thermocouple module that no longer requires thermocouple wires to be assembled. The wire is simply cut to length and inserted into the module directly. Setup now takes about 1/8 of the time it did before, without sacrificing reliability or accuracy. It has been called the "first true innovation in thermal measurement in more than a decade" by the first test customers. Big data, cloud processing, machine learning and APIs are important, but often generalized or misunderstood, topics in the NVH data acquisition environment. Please join us at this presentation to understand Mueller BBM’s approach to measurement testing, analysis and storage with respect to emerging technologies. The automotive industry has never experienced a revolution like the one currently unfolding. The very foundation of the car is mutating from a mechanical device to a mini-datacenter on wheels, driven by the advancements in electronics. Automotive parts require 0ppm failure rate and must be able to work in harsh automotive environments. This calls for special care at the design stage and a need to validate parts beyond compliance. The automotive Ethernet is a classic example of how many tests are required for compliance. This presentation will cover different test aspects of automotive parts and testing solutions from Tektronix. Shawn will discuss test design and how to avoid common pitfalls that can delay or derail the product testing process. He will offer a lessons-learned perspective to help ensure effective and efficient testing programs. Areas to be covered include: test specification, design, setup, schedule and reporting. Real examples will be used to illustrate common problems and potential solutions.